DRINK! That is the saying of the day. It could have changed because it wasn’t relevant the whole day, but it started early. Think of how easy it is to drink when you are all hot on a hotter summers day. Now think how much cold liquid you want to drink when it is cold weather, and you are cold. Now, when you are exercising and exerting – as we tend to do when cycling, it is essential to keep replacing lost liquid – even when it is cold and raining! Hence – DRINK! We left ftom the beautiful town of Hermanus at 07:20 before sunrise. I never knew there was such a large industrial area in what I have always considered to be a holiday village. We got off to an excellent start making fantastic time, even though it was raining. We had a break at the 16km mark and were pleased to see that we had covered the distance in about 45 minutes. the same distance yesterday took slightly over an hour. Even though it was raining, it was an absolute pleasure cycling in the rain, because the wind was still asleep. We stopped for a snack in Betty’s Bay and saw a large number of dolphins at Rooiels. We then made our way towards Gordons Bay, and it was fascinating to see that we were managing to climb the uphills at 18.9 km/h, faster than we managed to come down Akkerdisberg Pass yesterday, where peddling into the headwind we only managed 16 km/h – going downhill!!! The scenery is spectacular, and with the sun out and no wind, we took full advantage of the weather, stopping often to take in the the brilliant sights, sounds and scent that the area offers. When we got to Strand we took time for an ice cream – and WOW – what an ice cream it was. We had a chat to some locals and then headed for Heldeberg, our final destination for the night, arriving at 15:15. Total distance for the day is 100.6 km, covered at an average speed of 17.6 km/h and we climbed a total of 926 m while we were in the saddle for 5:41:50. Tomorrow is a rest / administration day so we can get the boxes to take our bicycles home. We also need to clean and oil our bkes. Friday we head for the Cape Town waterfront – route still to be decided. Today’s saying for the day is “Every day is a surprise”. I had an excellent steak for dinner, Neale had a burger, and when we left the restaurant it was raining. We had a relatively late night and an early start – having been too tired to clean the bikes last night it had to happen this morning what with all the mud and grime that had attached itself to the chains. We ran out of food for the road yesterday, but none of the stores that sell fruit were open, so we pumped my rear wheel and set off at 07:44. For those of you who don’t know, Bredasdorp is in a valley. we were heading to Hermanus, a beautiful see side town. Well the ‘down hill’ run began with us climbing 70m in 2.6km. One mighty uphill. We made good time because the wind was still asleep. :-). The wind started when we got over the mountain. We saw two El Paco’s to add to our list of animals – I didn’t mention the Baboons from yesterday – and decided that the frogs – of which we have seen zero – should also be added to the ‘seen animal list’ because like the multitude of cows and sheep, they often keep us company and entertained as we keep moving forward. It has come to our attention that we miss a lot when we zoom up and down the roads. I for one have never heard the frogs as I drive. We stopped at the first town, Napier, for a quick hot drink and some fruit. The town is so laid back that the Jack Russell that was in the street didn’t even move as we approached. We had multiple surprises such as climbing a total of 1134 m – to go DOWN to sea level (a little less than yesterday’s 1306m) as well as experiencing all the seasons every two hours. We cycled through five rain showers – not hard pelting rain like the highveld, but hard enough, and the sun shone through three of the downpours. Another surprise was that I felt wetter going up a mountain pass than I did cycling in the rain – without my rain kit. We had a quick lunch in Stamford and then made our way to Hermanus arriving at 16:30. We covered 95.3km, were in the saddle for 7:00:28 and managed an average speed of 13.6 km/h. Looking at our average speeds it is easy for one to think we simply crawl and what we are doing is easy – the numbers never lie – but what the numbers cannot reveal is the impact of a headwind – especially one of somewhere between 20 and 36 km/h does to average speeds. I have been asked again for some information on the ‘granny cog’ and gearing. Please let me know if you would like me to elaborate and give more details. After what we thought was a tough fifth cycling day we had a good night’s sleep – in fact I was so exhausted that I didn’t even pack my bag before I went to bed. Our normal routine is to prepare for breakfast and have our bags mostly packed so we can leave early. Anyway got up at 5:30 as usual and got ready, but off to a slightly late start at 07:30 after taking time for a few photos of the beach and river mouth. After about 400m I noticed I had a ‘little’ issue in the form of a flat rear tyre. Turns out this was a good thing, because while I went to pump my tyre Neale went to talk to some local cyclists – we have realised that we cannot accept information from just anyone, and cyclists seem to have a better idea of what we need. Most people see us on our bicycles yet do not comprehend that we are cycling, so they give directions as if we are in a car, without any concept of potential consequences to us if their information is flawed. 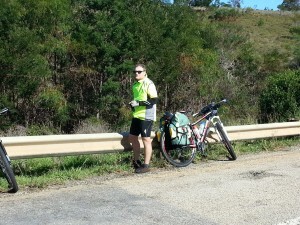 I pumped my tyre – no idea why it was flat – and off we went to follow in the tracks of the cyclists Neale had spoken to. The wind was calm and although it was biting cold – we are exceptionally grateful to have good warm kit – the going was good. That is until we got to the gravel, which was after 5km on the road. I found the going EXTREMELY tough and thought possibly my tyre had deflated agan, but looking at Neale’s tyres, they looked about the same, so either it was psychological or it could have been a lack of Muscadel the night before. I do believe Muscadel is my friend with about half a bottle giving me a nice warm feeling and no ill after effects. Neale on the other hand likes his wine (as do I) so I had had some red wine the night before, and I thought maybe that was slowing me down. We got a few kilometers down the dirt road when the sun disappeared behind the clouds and the wind started gusting. I should explain that while the wind makes it more difficult cycling, especially if you are cycling into a headwind, gusting wind makes it even more challenging because the wind moves you and your bicycle – mostly to the left or the right – so suddenly that you have to counterbalance, and then almost immediately readjust. If you think what gusts do to you while driving a car, you can only imagine what happens when you are on a bicycle. The headwind was so strong that we had to use what cyclists refer to as the ‘granny gear’ – the lowest and smallest front cog – to push DOWNHILL!!! As I mentioned before, having to pedal downhill is exhausting. I am sure I signed up for coasting downhill! ! At around 11:15 it was a whopping 11 degrees with slight moisture in the air and the wind pumping. The cloud formation and the scenery was spectacular – unfortunately too far off to get any good photos. It was almost 13:00 when it started to rain. We decided that the lady of a few days ago who advised us that the wind stopped when it started to rain was mistaken – unless that is how it works in her area. We pushed on into the wind and rain and got some directions from a local farmer – he as travelling with a young lady and is the first – and so far only – person to offer us a lift. It was shortly after meeting the farmer that I had my first fall – on an uphill! The track / road was so steep and rutted that I was spinning and not going anywhere fast. I couldn’t release either of my feet from the pedals and eventually fell off to the left. I did hit my knee but am unhurt – the water bottle on my back helped cushion my landing. In fact it was a relief to lie down a little! As I fell off my phone rang – which on its own was amazing as there were large stretches of no reception – with my youngest son calling the to ask how he could check airtime on his phone. He then asked if I was on my bike, and when I replied that no, I had just fallen off, he calmly reminded me that was why we had plasters and bandages in our medical kit! We got slightly lost – only traveled 1km when Neale realised we seemed to be on the incorrect road. We then programed the GPS and headed back. We were even accompanied by a beautiful male ostrich for a few meters. We crossed a bridge over a river and stopped for a hot drink and lunch – in the light drizzle – at 13:22. It is wonderful having our table cloth to sit on. It was 10 degrees with a softer wind. While eating lunch a gust blew a chunk of my lunch onto the ground, so I had to eat that chunk more carefully because the gravel is not great for one’s teeth. :-). The comment of the day happened while having lunch. There were a few contenders for the day, like the cyclists asking Neale if we are mad, or the farmer offering us a lift, or even the multiple BAAAA’S of encouragement we got from a number of sheep, but while resting and eating my gritty lunch, a distinguished female American voice announces “Head northeast and turn right”. When I stopped laughing and could breathe, I shared the joke with Neale who also had a great hearty laugh. I realise the comment may not be nearly as funny when being read, but it’s timing made it brilliant!
. We got the keys and were informed thatthe restaurants in town BOTH clospe around 17:30 so we made haste to get some provisions. Carrying two large packs of firewood on a bicycle is entertaining. We had a pleasant dinner with ribs for starters and roast chicken and vegetables on a bed of rice for dinner. The accommodation is different. On the plus side there is a twin tub washing machine and a tumble dryer. On the negative side there was no toilet paper – though there was soap – and the bath is minute! So small that even I cannot lie down – or sit up – without bending my legs. We traveled for a total of 7.5 hours, were on the saddle for 6:42:27, climbed 989m in 93km (including the trip to the shop) with a slow average of 13.8km/h and a maximum of 47.5km/h. We have a break day today. Tomorrow is expected to be tough with an expected 85km off road, heavy winds, cold weather and a pridicted 50% chance of rain. P.S. For a long time Neale and I have spoken about hills being “negative declines” as ‘uphills’ can be scary. Yesterday Neale decided we can now also talk about “negative tailwind” as any mention of wind simply scares us. His comment was also a contender for comment of the day, as was my comment “Muscadel is my friend”. I have been asked about the ‘patch’ over my right eye that is visible in the photos. it is in fact my rear view mirror. I have close up photos (thanks to Neale) which I will share when I can upload photos again. #bruisedbuttcyclechallenge. Day 6. Riding day 5. A LONG, HARD day!!! We headed out from Dias Beach, Mossel Bay at 07:10. It was a clear day, even if it was cold. We made great time for the first three hours – and then we got lost. We had planned to ride about 97km for the day, but the road that is on the map doesn’t seem to know it is supposed to be there. We thus had to modify our plans slightly, which involved getting back to the N2 highway and some tar. We know things turn out for the best because the detour allowed for us to have a sit down lunch of slap chips (soft French fries to the unenlightened) and a coffee for Neale. We also topped up our chocolate supply because the off road section we covered used up a lot more energy than planned for. The detour also allowed for me to attend to some urgent work. Our host at the lunch stop, a great man who cycles in the area whose name is ‘Boy’ helped us by telling us of the most direct, off road route, to our destination in Stillbai. The off road section was an adventure – exceptionally grateful for shock absorbers – and we managed to arrive at our destination at 17:45 with about 20 minutes of day light to spare. We had a fantastic dinner of chicken kebabs with mixd grilled vegetables and baked potato, all washed down with some ok wine. We finished with. ice cream for dessert. In the end we cycled a total of 115.3km with an average speed of 17.4km/h and climbed a total of 1106 m.
After a very pleasant stay at March Hare Cottage in Storms river, and a very good meal at the hotel pub across the road from the cottage, we had an early night and we left at 6:50, shortly before sun rise. The first 20km were very pleasant. We had a short break before going down Bloukrans pass. IT WAS FREEZING!!! And spectacularly beautiful. Although we thoroughly enjoyed having the entire road to ourselves, it is very sad that the pass is clsed to the public, thus denying a great many people the opportunity of seeing the beauty of the natural forest. Stopped in Natures Valley for a second breakfast – we are going to have to stop that, firstly because we will put on weight, but mostly because we are informed we are heading for bad weather, and we cannot afford the time. We expexted to climb a lot today, especially because we were doing two valleys, and although we did climb more than yesterday – a total of 1162 m over the 109.4km we cycled today, we are grateful that we didn’t climb the 2000 m we expected. 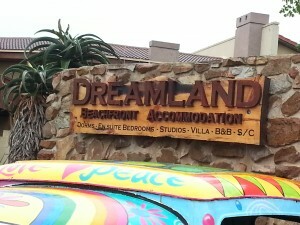 We arrived at Paradise House in Knysna, our home for two nights -at around 16:20, for a total of 9.5 hours on the road and 6.28 hours on the saddle. The drive wat is so steep that after a hard days peddeling we had to push our bikes the last 30 meters or so. Tomorrow we intend to clean and prepare our bikes for the next leg, and also get some work done. We will also be meeting Wayne Burinrows’s dad – thanks for arranging Wayne. While I am thanking people, thanks to Roger and Marco of Roger Wolfson and Associares (http://www.rogerwolfsonandassociates.co.za/wmenu.php) for the fabulous job you did repairing my bags and Patrick of Meat on Grant – our excellent neighbourhood butcher – for assisting me with the vacuum packaging my meds. It is working like a charm. Funny sight of tye day. Neale was in front of me and went wide to avoid a goat. the unhappy mother then chatlrged under the saftey rail and butted her baby out of the way. Clever mommy. Day 2 #BruisedButtCycleChallenge – Jeffrey’s Bay to storms river. Day started with rain and wind. Within 500m in the half dark, Neale managed to pick up a piece of metal that wrapped itself around the rear hub – fortunately not the gears or the derailer as tgat would have been disastrous. After a short stop to establish what the knocking soubd was, we fixed the bike and then visited Mcdonald to wash our hands. :-). We then headed out again – straight inti a howling south Wester wind. 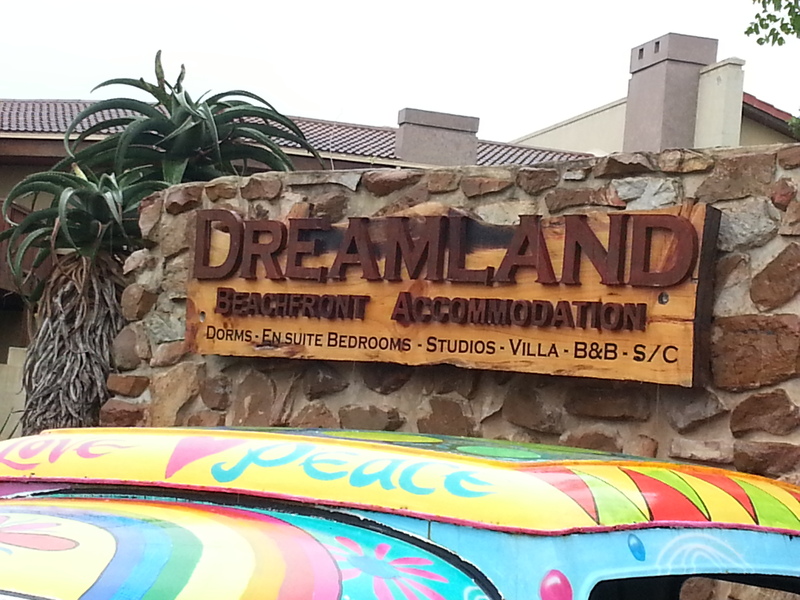 It took us 90 minutes to cover the first 15km, so we stopped at le Chameleon – a wonderful oasis in Humansdorp. What a fantastic place – well worth visiting. After some good coffee (Neale) and hot chocolate (me) as well as a hot breakfast we again braved the howling wind – managing just over 7km per hour on a flat surface. I love cycling because you can coast down hill – that didn’t happen today. Our top speed was 41km per hour, and that was achieved by peddling down hill! We are grateful for our clothes, they helped to keep us dry and warm in both the wind and the rain. We eventually worked well as a team wirh each of us taking turn to lead into the wind. We saw some beautiful bridges and scenery, coveribg 109.2km for the day, climbing 1030 m with out butts in the saddle for 7 hours 26 minutes, and a total trip time of just over 10 hours. Overall a good day. Our legs are sore, but not nearly as sore as my butts! from departure to arrival was 5 hours 10 minutes. It rained lightly for the last 20 km or so, and we were very happy there was very little wind. The people of PE are amazingly friendly. One cyclists even cycled with us for about 5km to have a chat. Wehad one cold spot going down van Staden’s pass – where the thermometer lied – it said it was 17 degrees Celsius, but I had just put a jacket on and my hands froze. I suppose that’s what happens when the thermometer sits behind a bag. We climbed a total of 646 m today – apparently our shortest and easiest day. Gratefula for wifi today so I am able to update. 5:53am. Getting ready for an early start. Day 1. It is not too cold. Still very dark outside. We intend to depart at first light.